I recently stumbled upon a great lecture series on modernism in architecture, called “The Legacy of Modern” at the Los Altos Community Foundation. Not only are the lectures educational for anyone interested in archtecture and design, but the cost goes toward restoring a rare Richard Neutra house in the South Bay. I missed last month’s lecture by Alan Hess, architect, author and architectural critic of my alma mater, the San Jose Mercury News. But I managed to get there Thursday night to hear journalist Dave Weinstein and author of Signature Architects of the San Francisco Bay Area. Weinstein spoke about the architects of some of the much-loved mid-century Eichler built homes in the Bay Area. The audience was loaded with Eichler home owners. Weinstein shared funny anecdotes about local architectural legends who designed many Eichlers, such as Bob Anshen of Anshen + Allen, and showed some excellent photos. If you arrive early enough, you can go through the restored Neutra House, which was once one of a small cluster of three affordable modern homes designed by the legendary Neutra. Though Neutra was born in Austria in 1892 (the same year as Timothy Pflueger), he became a leader of California mid-century modernism after he moved to the Los Angeles area in the 1920s. A community-led effort helped preserve the last remaining of those three small Neutra houses. The cluster of simple, flat-roofed redwood clad homes, completed in 1939, was a writers commune on Marvin Avenue near a prune orchard. Two poets, Clayton Stafford and Jacqueline Johnson, had hired Neutra to design their respectives homes and a third smaller guest house on a half acre lot at 180-184 Martin Avenue. The project to save Johnson’s house started in 2005. 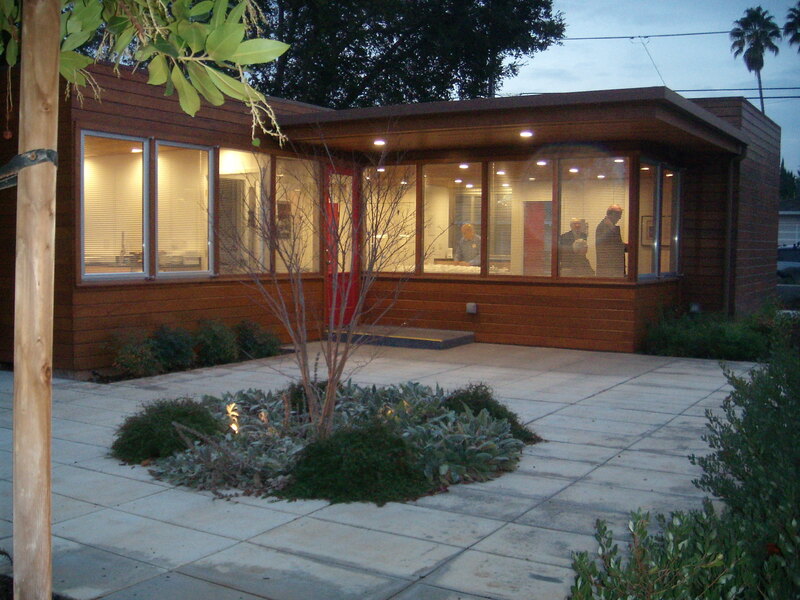 The city of Los Altos was given the house and moved it to its current site on Hillview Avenue. King Lear (yes that really is his name), who was on the Los Altos City Council, helped spearhead the project. The project included cutting the house in half to move it three blocks from its original location to the City Community Center on Hillview. The house was seated on a new foundation. Structural components damaged by dry rot or infestation were replaced. Green paint was stripped from the redwood and original siding was sanded and treated. A new covered entry was built to shelter the front door, replacing the original carport. All the work on the house, including modifying the interior to be used as a small conference center, was completed in 2008. Large airy windows, which once faced the prune orchard, now face a patio (see above photo) which can be used for outdoor functions. You can read more about the project here and if you visit for another one of the upcoming lectures, you can watch videos about Neutra and his work. The next upcoming lecture will be by San Francisco architect Jonathan Pearlman who will talk about the evolution of the modern house from mid-19th century England to 20th century America, on February 11. Save the date! UPDATE: Another Neutra house will be on view February 9, with a lecture by his youngest son, Dr. Raymond Richard Neutra, sponsored by the San Francisco chapter of the American Institute of Architects. Attendees will see Neutra’s house in the Marina district, at 2058 Jefferson Street, near Baker. That house was put on the market in early January, for nearly $4 million. A series of photos and more about the house itself can be found here at CurbedSF. Actually VDL was BUILT in 1932 and destroyed by fire in 1963, VDL II was built between 1964 and 1966, as such, the photo of Richard himself was taken upon (or near) its completion the second time. We have documented all the Neutra, Schindler, Wright, and Lautner houses in LA…. Very cool. Good to know about your organization.